Travel has always informed my designs. In March of 2012, we spent several weeks visiting friends in Bangalore, India, and while there, made a short detour to Jaipur and Agra. (A quick aside, Agra gets lots of press because of the Taj Mahal, but Jaipur is worth several days of exploration.) The stone work in the buildings of Jaipur ranges from bold patterns, to complex designs. This pen was inspired by a black and white marble runner circling a room. 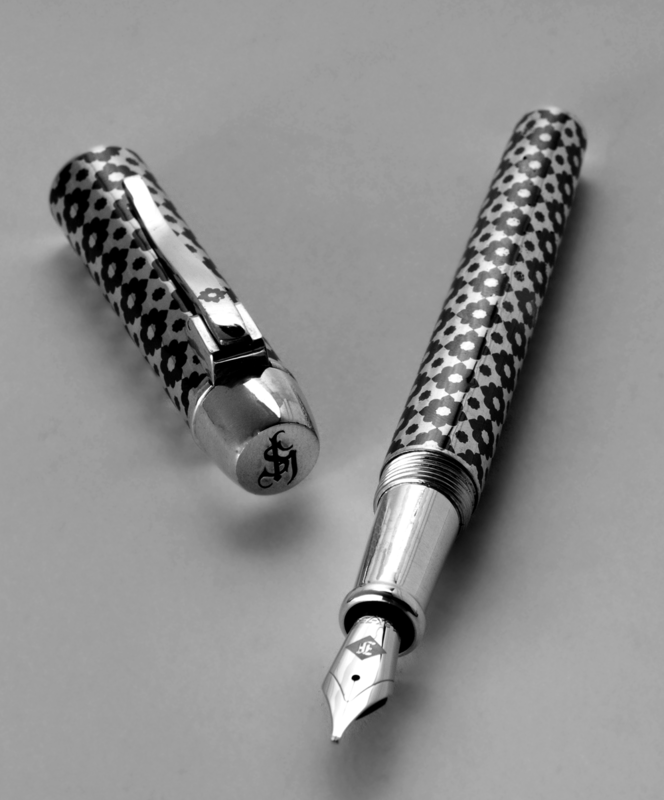 The body of the pen is cast in Argentium silver, and the contrasting inlay, with niello. The rhodium plated, 18kt gold nib is available in extra fine, fine, medium and broad. There are 10 available in Argentium silver, and one in 18k gold. Each pen is individually made once an order has been placed. Please expect 4-6 weeks for completion.